The National Highway Traffic Safety Administration plans to test dummies in back seats in new models as part of its 5-Star Safety Ratings Program. WASHINGTON -- Crash test dummies, who have dutifully endured thousands of simulated accidents from the front seat, are about to get a ride in the back. Regulators are making the move as part of a new emphasis on the safety of back-seat passengers, including children in car seats, which has lagged advances made for those riding up front. Lending urgency to the effort: the rise of Uber Technologies Inc., Lyft Inc. and a new car-sharing economy that has more people riding in the rear. 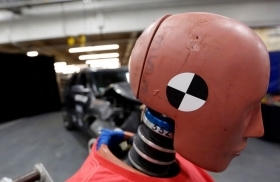 The National Highway Traffic Safety Administration plans to test dummies in back seats in new models as part of its 5-Star Safety Ratings Program beginning in 2019. The program, started in 1978, has so far only measured safety for drivers and front-seat passengers. Advocates say automakers should make greater use of airbags in the back, improve seat belts so they work more like the ones in front that tighten during abrupt speed changes, and conduct education campaigns to encourage buckling up in the rear. That could help match the substantial gains that have been made in safety for drivers and front-seat passengers, thanks to such developments as better restraints, airbags and seats designed to absorb shock by giving way in accidents. Safety advocates say the design changes to front seats has had an unintended consequence for those in the back: some have a tendency to collapse in even low-speed rear-end collisions, killing their occupants or the children seated behind them. That’s what happened to Andrew Warner. In November 2010, Warner and his wife, Liz, were driving their new Honda Odyssey with three-year-old Jake and 16-month old Taylor in the back seat. They were waiting to turn into their suburban Houston neighborhood when another minivan rammed them from behind at 55 miles per hour. Warner says he remembers a jolt and being pushed back into his seat by the G-force “like a rocket.” After the crash, Liz said there was something wrong with Taylor. The seat had hit her on the head. She was breathing, but blood was coming out of her mouth, Warner said. “She was more or less gone,” Warner said. She later died. In emergency rooms in New York and other major U.S. cities, doctors have a nickname for another type of head injury: partition face. It’s what happens when a back-seat passenger riding in a cab doesn’t bother to wear a seat belt. In a rear-end collision, his head is thrust into the Plexiglas barrier. That can lead to a concussion, stitches or a fractured eye socket. New York City authorities estimate about half of all cab riders are going without seat belts, perhaps under the mistaken belief that because they’re in a commercial vehicle they’re safe. For the U.S. population as a whole, about 87 percent of all car passengers are belted. The National Transportation Safety Board convened an all-day meeting of auto-safety experts, like Arbogast and executives from Volvo and ZF TRW Automotive Holdings Corp. that looked at the issue from vehicle design to public education and ways to increase seat-belt use. “I don’t think it’s malicious, it’s just expensive,” NTSB Board Member Bella Dinh-Zarr said about the industry’s lagging attention to the back seat. Rear-seat safety is going to get more important as more people use ride-sharing services like Uber and Lyft, she said. The auto industry believes the single best safety system to protect occupants in the rear seats is the safety belt, said Gloria Bergquist, a spokeswoman for the Alliance of Automobile Manufacturers. The Washington-based trade group whose 13 members include General Motors Co., Ford Motor Co. and Toyota Motor Corp. has recommended NHTSA include selt-belt reminders as part of its crash-testing program. It’s challenging to migrate all front-seat technology like full-size frontal airbags to the back seat, Bergquist said. Other measures like side-impact airbags and inflatable seat belts have been introduced, and things like belt pre-tensioners should work in the back seat, she said. Every seat on the market today exceeds NHTSA’s standard, and most seats are three or four times stronger than required, she said. Even the simplest steps, like adding seat-belt pre-tensioners to the rear seating positions, aren’t common. Pre-tensioners use sensors to tighten belts when a crash is imminent, ensuring they are in an optimal position to restrain occupants. Without pre-tensioners, people can slip out of position in a crash, leading to head injuries from contact with the interior, partial ejection or broken bones. On collapsing seats like the one that killed Taylor Warner, NHTSA researchers have identified a tradeoff between stiffer front-seat structures and designs that give back a little, like a catcher’s mitt. Seats that are too rigid can hurt people in the front seat by causing whiplash-like injuries. All too often in minor crashes the front seat collapses, leading to dozens of preventable child fatalities each year. In a September 2015 petition to review the federal standard for seat strength, Alan Cantor of the safety consulting firm ARCCA Inc. said NHTSA’s 1960s-era requirements were so weak that lawn chairs and cardboard seats could pass. A rear-end crash of 2 mph to 5 mph could generate enough force to overcome occupied seats built to that standard, Cantor said. The Center for Auto Safety followed that petition with one in March calling for NHTSA to issue a public warning to parents not to put their children directly behind occupied front seats if possible. An analysis showed 898 fatalities between 1990 and 2014 in which children died in rear-seating positions when the front seat was occupied. The federal crash databases don’t code for seat-back collapses, and that’s part of the problem, said Clarence Ditlow, the center’s executive director. NHTSA has examined the issue and declined to act in the past based on lack of data. Still, the fatalities are piling up in hundreds of court cases across the country. “It’s so obvious they need to do something,” Ditlow said. Agency spokesman Bryan Thomas said regulators have to balance whether changes to help one set of occupants will hurt another set, and the engineering is more complex than it’s sometimes portrayed, he said. The agreement NHTSA negotiated with the auto industry to roll out automatic emergency braking as standard equipment will eventually help rear-seat passengers, Thomas said. Once the technology becomes widespread, it will help reduce the severity in of the types of high-speed rear-end crashes that cause the greatest harm to people in the back seat, he said. Warner, 36, the father in the 2010 crash, turned his attention to possible auto defects after more than a year of mourning for Taylor. He discovered there have been hundreds of child fatalities caused by collapsing front seats. He’s trying to get members of Congress to force NHTSA to make seat-backs stronger. Taylor would be in the second grade today if she had survived. Warner says he wishes he could be worrying about getting her to school or soccer practice rather than trying to prod regulators and Congress to make changes. But he views the process as a way to ensure his girl didn’t die in vain.